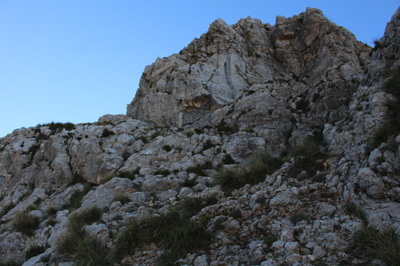 The summit of Puig Major is officially a military zone, off limits to hikers. 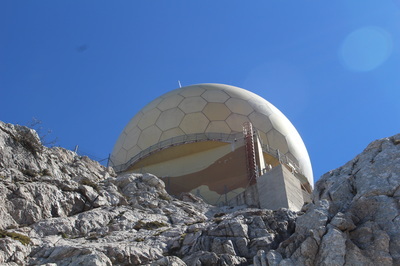 It is unclear whether the no go zone is limited to the perimeter of the fenced area right by the summit and the radar installations, or comprises an extended part of the higher reaches of he mountain. However, for all practical purposes there is no fence to stop you nor any signs forbidding entry along this popular route. Just be aware that there is a possible right of way issue close to the summit, although I have never seen anyone up there to discuss the matter. This is one of the more difficult walks in the serra, involving some very steep scrambles. 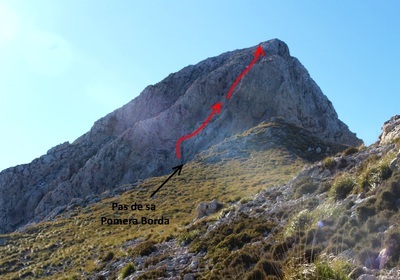 The Pas de Sa Pomera Borda is a short and narrow crag, in the middle of which a small apple tree grows. It is fitted with a rope and easily climbed. There is a long, very steep and quite exposed scramble just after this; a few lengths of wire rope (some of it in poor condition) have been fitted to help passage over smoother rock sections. The whole walk is a bit of an adventure and requires a good level of fitness & agility as well as a reasonable head for heights. It is not suitable for children or canines. 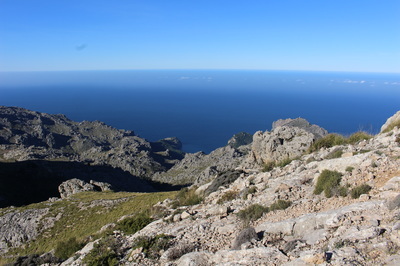 The walk starts on the Escorca (Gorg Blau) to Sa Calobra road (Ma 2141), a short distance before the Col des Reis and the start of the long descent to the sea. 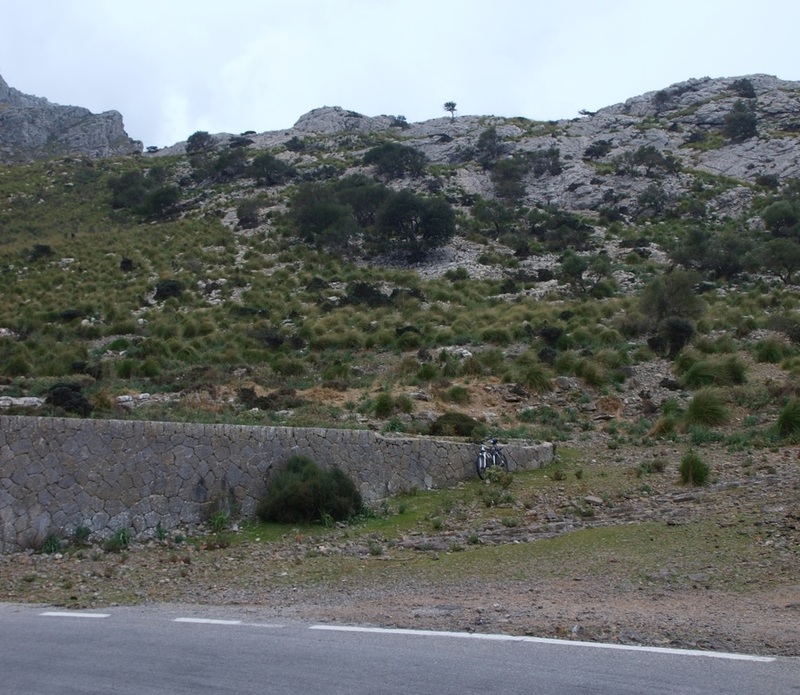 Look out on the left hand side of the road for a rounded, perfectly built dry stone wall. You will see a power line going up on a ridge above. 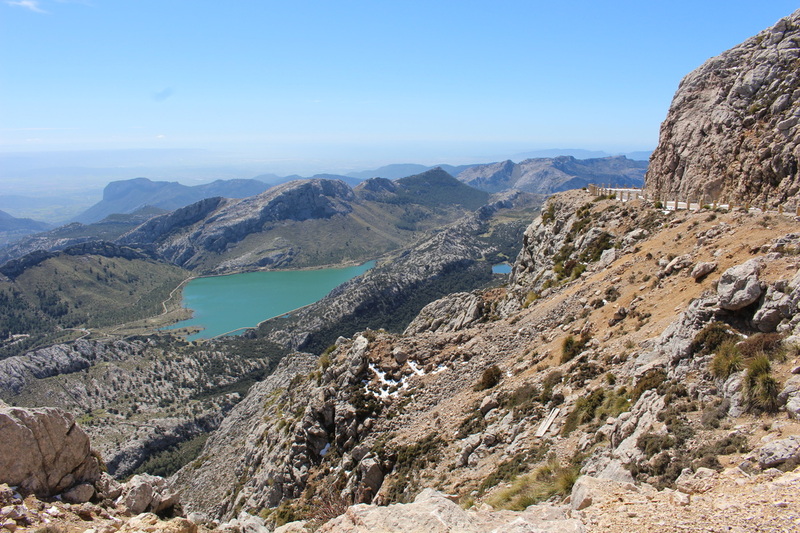 There are often cars parked here as this is the starting point for many popular hikes. 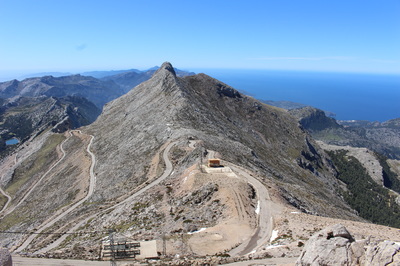 This spot is called es Finicular, referring to a post war cable car project that would have started here and run all the way to the summit of the mountain. The project was shelved and Puig Major became a military base instead. Coming by car, you can park here. By bus from Soller and/or Palma, your best option is to take service 354 at 08:40 from Soller town (1st of April till 1st of October only, no service on Sunday) and jump off at the Sa Calobra turn off. It will then take you half an hour to walk to es Finicular. 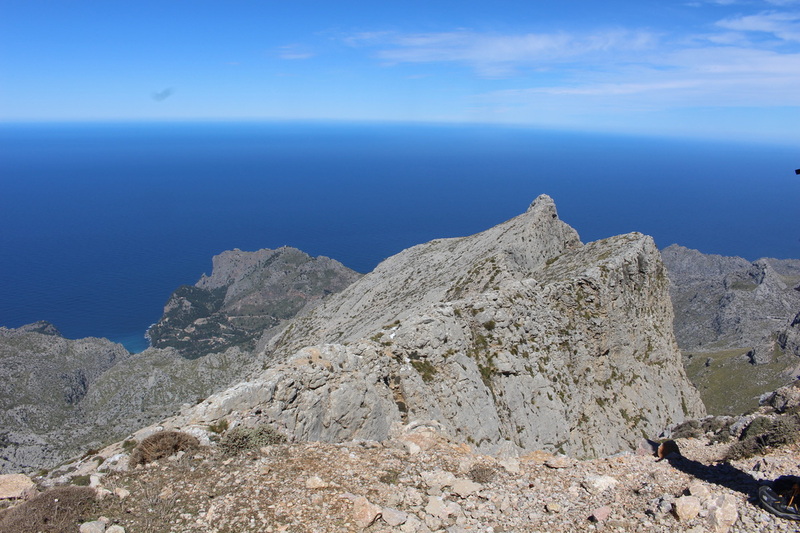 The return bus service goes by the sa Calobra turn off at around 18:00. From Es Finicular, find the cairned trail going uphill towards the ridge above the road. You will reach a small col at Porxo Esbucat with some electricity lines. Backtrack a hundred meter, and leave the main trail heading more or less south towards the mountain and the first small set of cliffs. 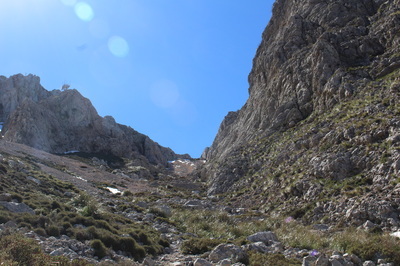 The way here is not clear and not well cairned.but facing the mountain you want to go slightly to the left and look for a possible passage up the first set of cliffs. This is easily found (just a ramp going up) and once atop the first cliff, go up and to the left again on the steep slope in front of you. 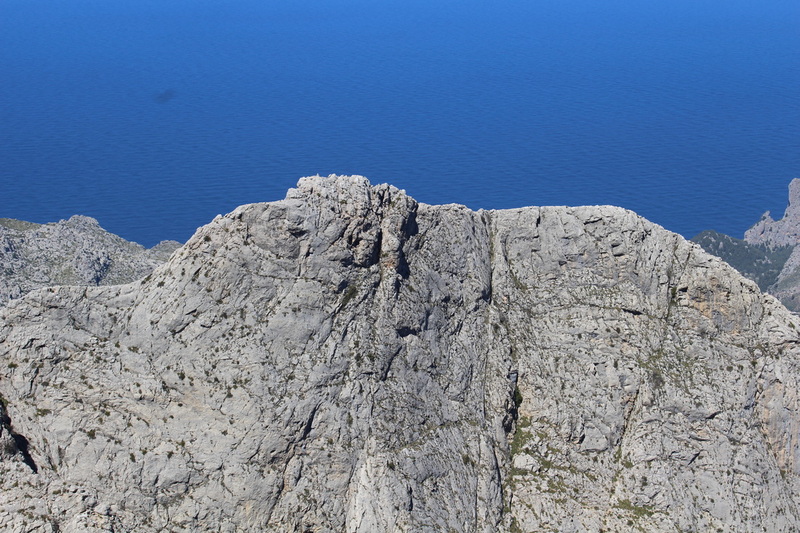 Follow the second set of cliffs to the left till you find the only possible passage, with some small cairns at the bottom end. 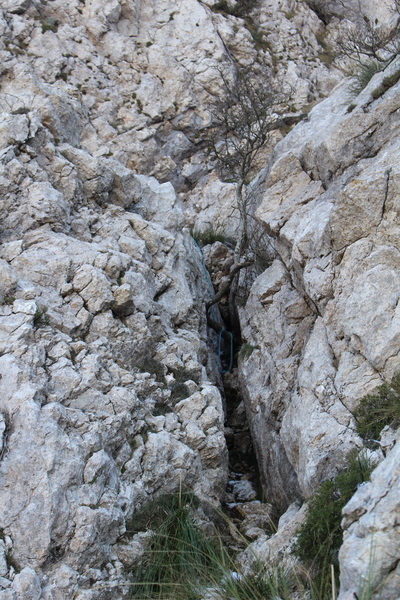 This is a narrow but steep gully that is best climbed on the left hand side, with a couple of exposed passages. 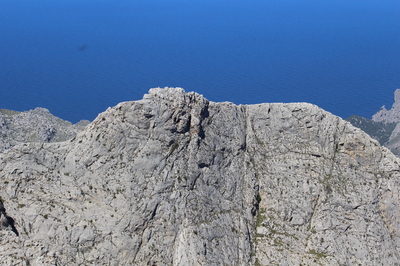 You will get to the top of this second set of clifs in about ten minutes, and find a steep slope in front of you with a minor summit right above. 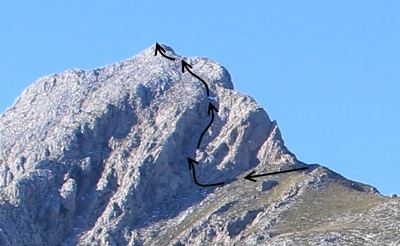 The easier way up is to follow the slope on the right of this summit, forming a sort of long steep valley. ; it is a quite a tiring climb on slippery ground. You will reach a long boundary wall after about 30 to 45 minutes, that you cross and turn left onto the ridge of the serra de na Rius. 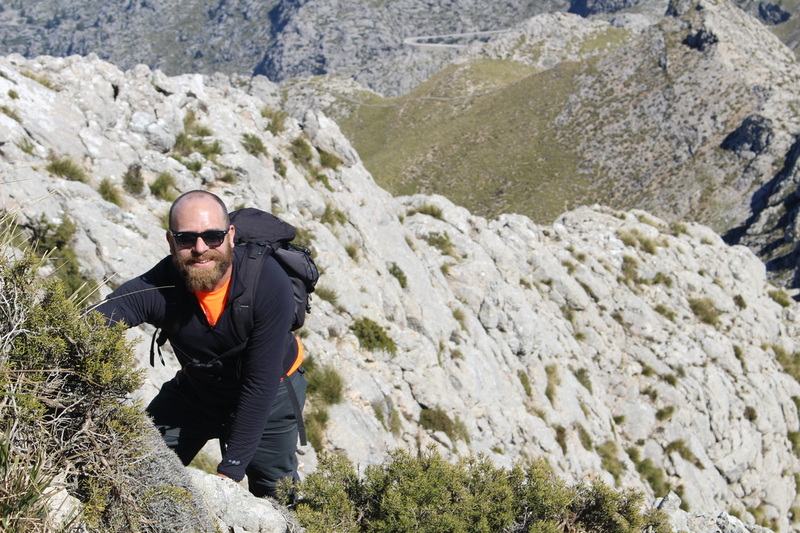 An alternative is to aim for the small gully right in the middle of the minor summit and scramble up slightly to the left of it to reach the ridge, slightly shorter but a lot more difficult. From here onwards, the way is cairned. 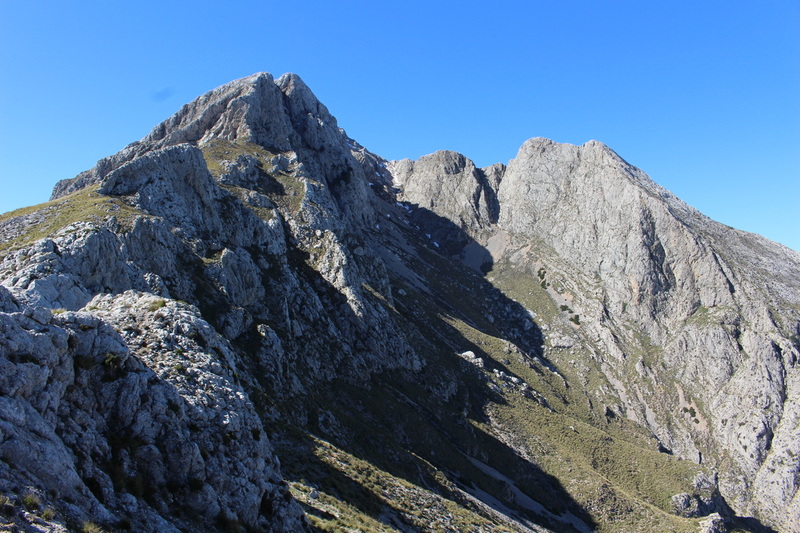 Follow the ridge on its left (South East) side all the way up to the big set of cliffs at the bottom of Puig Major. 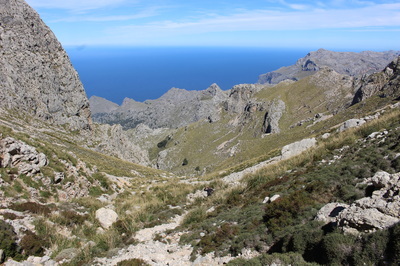 It is comparatively easy going, and a further 45 minutes following the cairn line will bring you the foot of the cliffs and the Pas de sa Pomera Borda. Wiggle your way up the narrow chimney the trickiest bit is to get out at the top and squeeze you pack out. A long slope is now in front of you. going up towards the summit at an angle of often more then 45 degrees. Proceed up with care, the ground is slippery in places and the way is exposed. You should reach after more or less 15 minutes a set of smoother rocks where a length of wire rope has been fitted to facilitate passage. It is damaged at the level of the bottom fastener so do not over rely on it. Once over the cabled section, the way gets gradually easier and you will emerge on less vertical ground, Have a breather, the way from here is quite obvious and your are only 15 minutes and one steepish climb away from the trig point next to the summit of Puig Major. The view from the trig point is amazing. 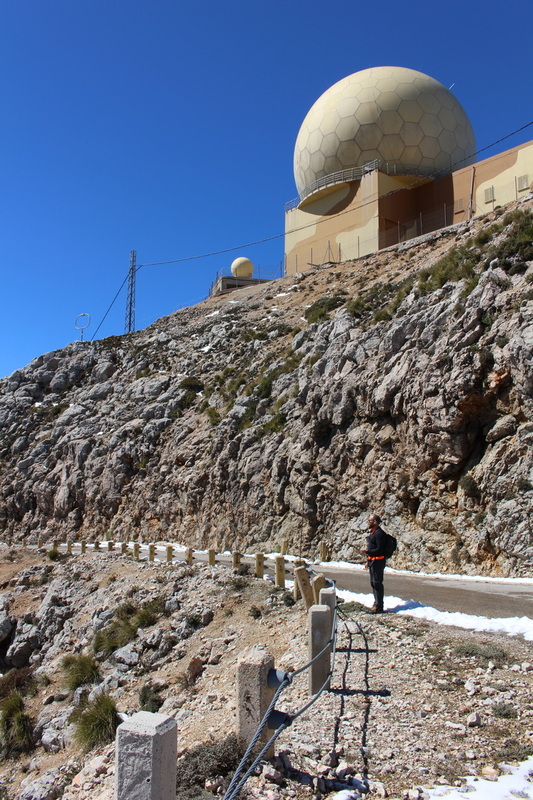 Follow the ridge towards the radar station and rejoin the tarmacked road. 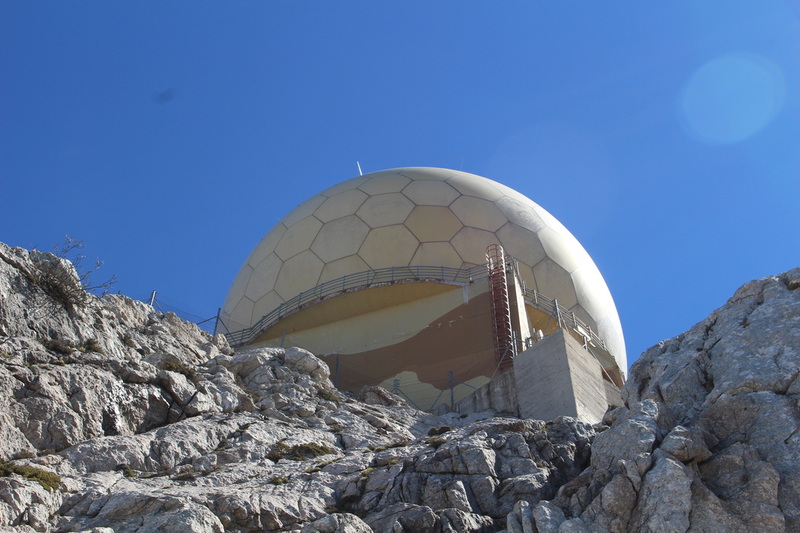 Follow this around the military zone, coiling around the top of the mountain and the slightly intimidating radar dome. 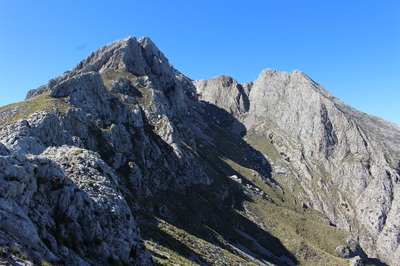 The road turns north just below the summit. 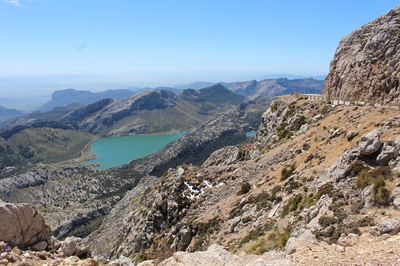 At the first hairpin bend, you will find the Coma d'en Ribell, a long and steep scree valley stretching all the way to the foot of the mountain at the foot of the Morro d'en Pelut. 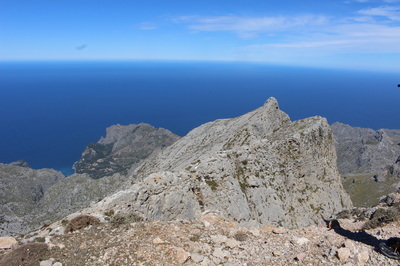 This is the way down for this hike, but those looking for a longer walk can follow the ridge all the way to the Penyal de Migdia by continuing down the tarmac for two more hairpin bends before heading along the Migdia ridge; or you can follow the Morro d'en Pelut ridge and head down that way. 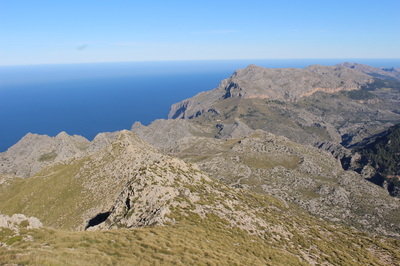 After the cliffs, a further 20 minutes walk will bring you to the intersection with the Cami des Cingles that rounds Puig Major on its northern side. Take a right here, and you will soon arrive to an unlocked gate marked 'Bini Gran' . A further 20 minutes will take you back to the Portxo Esbucat, from where you head back down onto the main road and home.